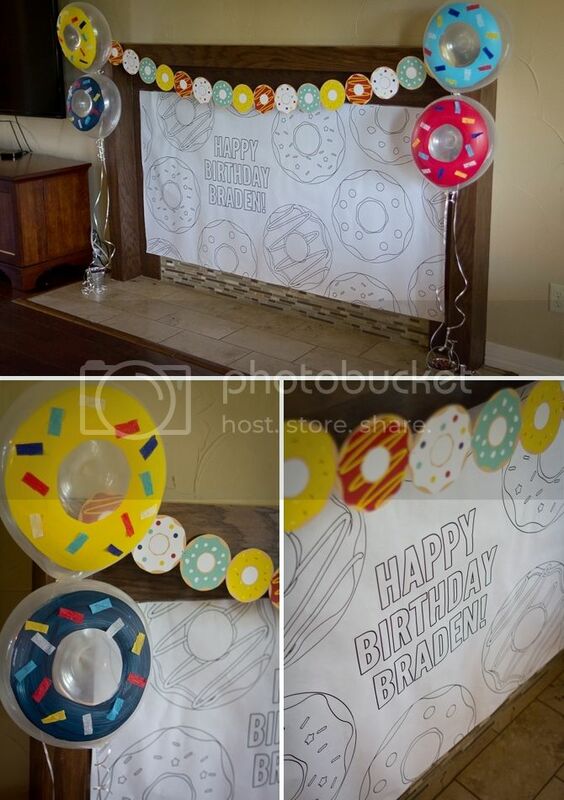 When I asked Braden what kind of birthday party he wanted to have he (of course) said he wanted a donut party. This is, after all, the boy who wanted to be Cinnamon Toast Crunch for Halloween. So we had a donut party. 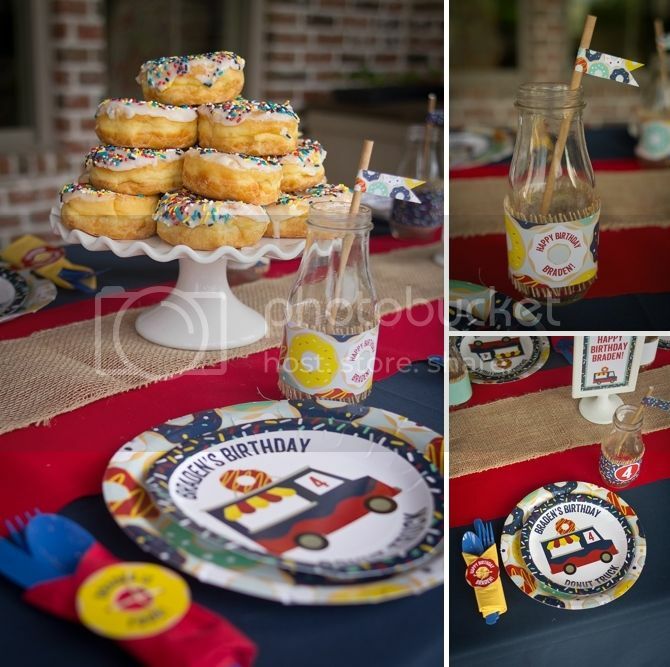 I found a cute donut truck image on Etsy that became the inspiration and started planning different donut themed treats. It was a very sugar and carb heavy party! 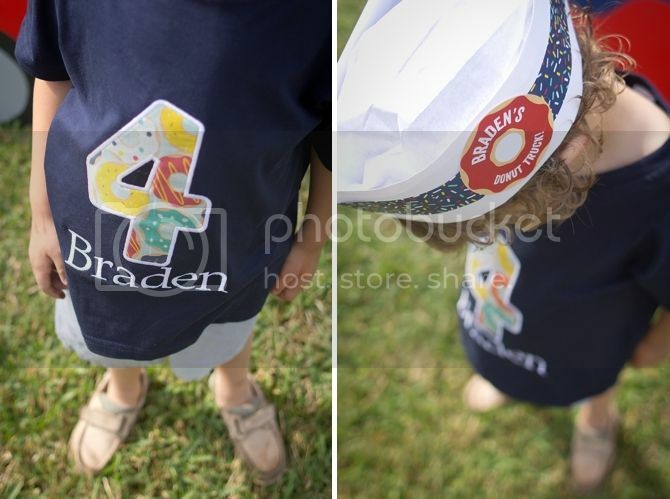 I custom printed some fabric with donuts on it that my neighbor embroidered on to his shirt and found these little paper hats I embellished with some printables--and we were ready to start selling donuts. Since we couldn't have an actual donut truck (they certainly don't exist in Beaumont!) I constructed this PVC pipe awning to be a stand in. If anyone asked at the party, I proudly told them I made it ALL BY MYSELF after the man at Home Depot cut all the PVC pipe. I tried to have a few breakfasty type treats (pancake kabobs, fruit) to break up the plates of SUGAR. But it was hard. I commissioned a local macaron baker to make cute donut macarons and they were a big hit! And they were adorable. I ordered a large custom mix of sprinkles that matched the party and gave her a little baggie of them to sprinkle on top. 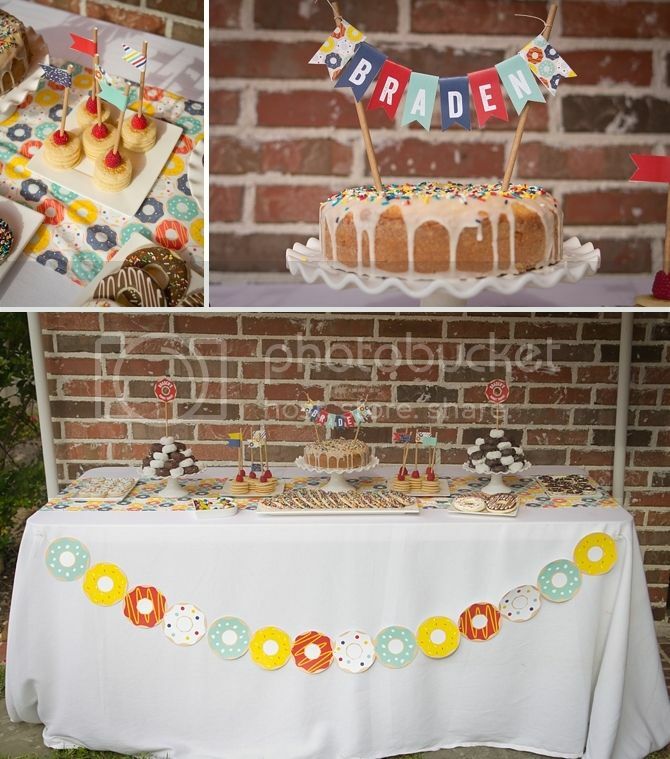 The cake was probably my favorite part--it was so simple to make! And so cute. 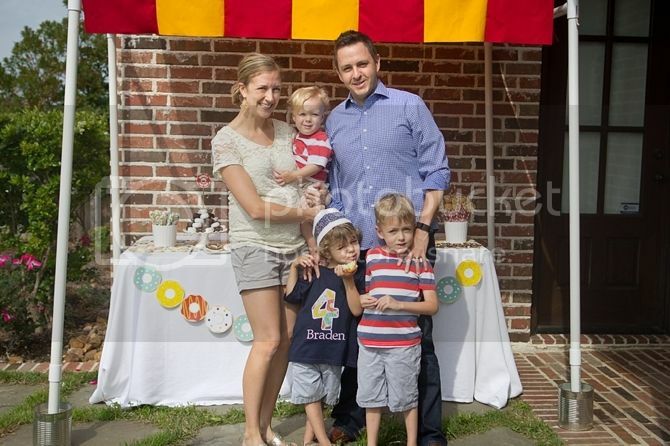 I think this may have been my first party without cupcakes--but we certainly didn't miss them! Have you heard of fairy bread? It's an Australian treat--bread with nutella and covered in sprinkles! 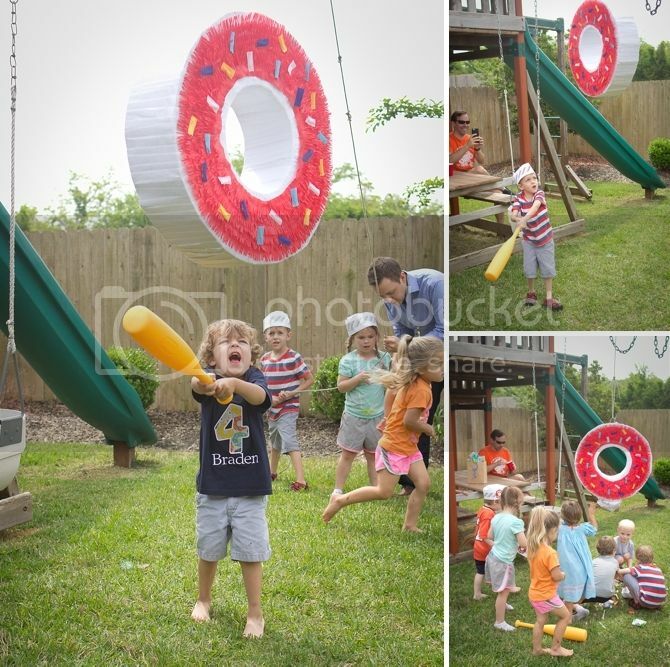 I cut mine into donut shapes and snacked on it for several days after the party. 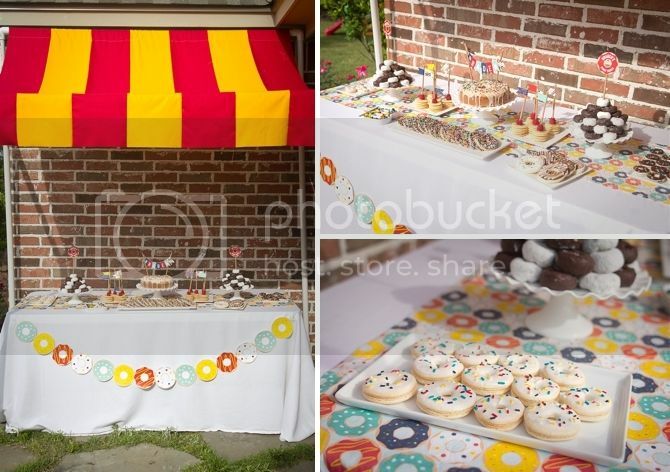 I love making towers out of storebought treats that take up a lot of visual space but are cheap and don't take any time to make--so donut towers! I think I singlehandedly ate all the chocolate donuts. And Victoria (of course) made her famous sugar cookies in donut shapes. I served the extras the next day at bible study and everyone was literally in awe of their deliciousness. 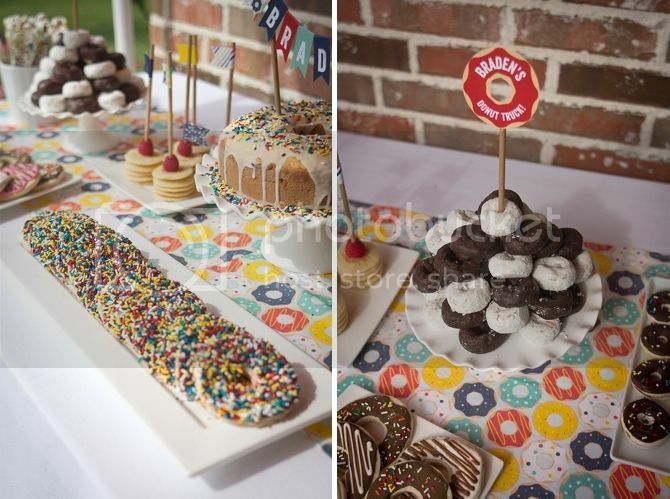 Seriously, the cake and the bunting. It was my fave. I sent Vic a picture of the cake mid sprinkle to have her help me not go overboard. I tend to go overboard. The cute little kids table was my favorite part. 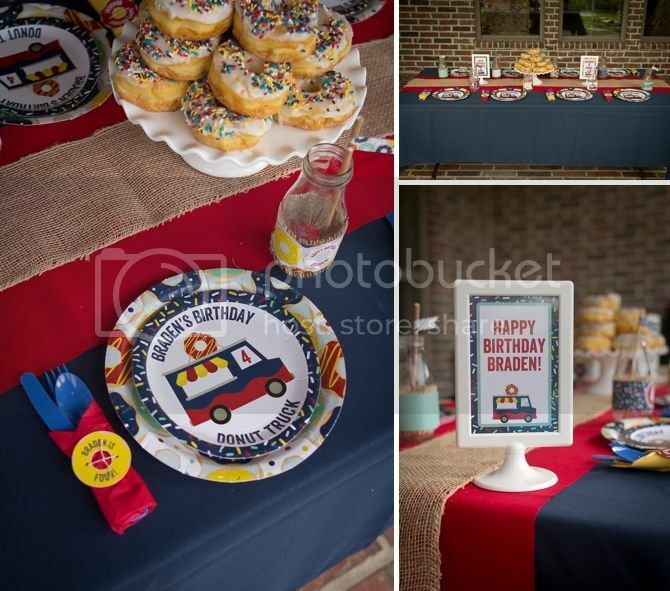 I normally buy the boys a melamine plate to match the party--but we have a TON of melamine plates, so I opted to print paper ones this time and LOVED them! They were so cute and made the table look even more coordinated. 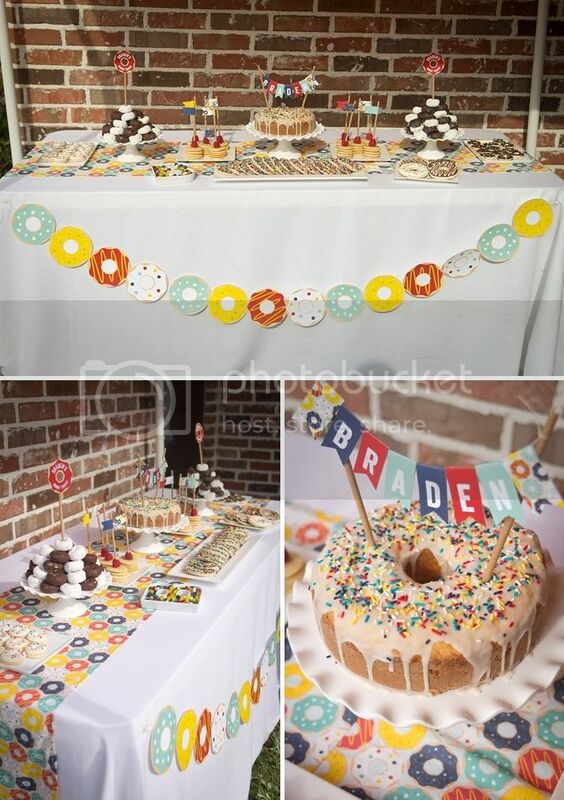 And another donut tower as the centerpiece. The donut shop didn't bat an eye when I asked them to make my batch of white sprinkle donuts with my custom colors. 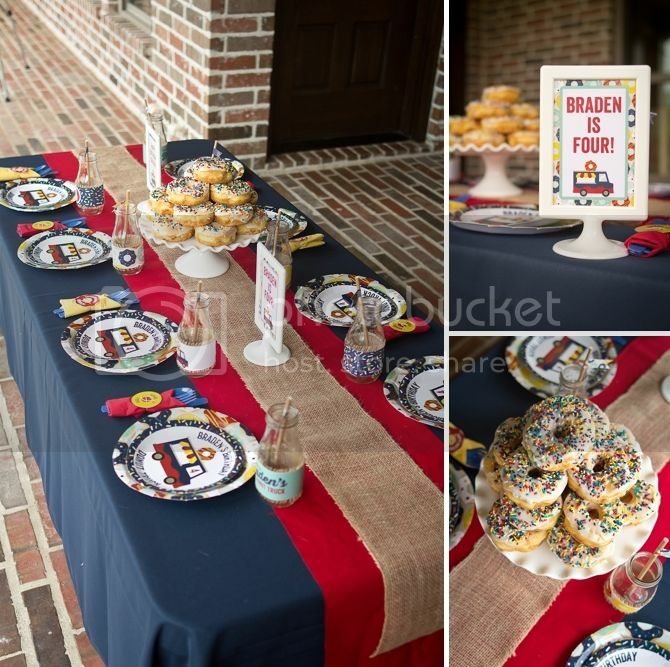 Braden was so excited about all parts of his party--when he came down in the morning he said, "WOW! WOW!" and was thrilled. Mission accomplished. It just made my heart so happy to see him enjoying everything so much! 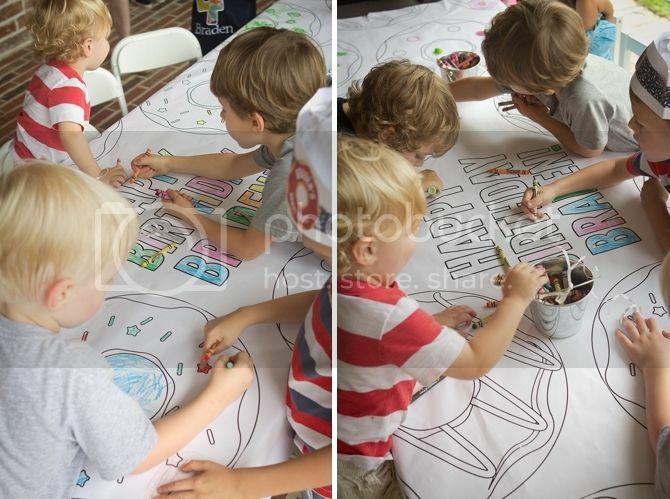 Coloring walls are another of my cheap, large visual impact faves. This one was $4.78 at the UPS Store--it served as a wall decoration until we were ready to color it! The balloons (while still one of my favorite parts) were a bit of a fail... I bought them last thing Friday night to paint them and by Saturday morning they'd lost just enough helium that the added weight from the pain made them all droop forwards. I wouldn't have had time to do them Saturday morning--so it was good enough! I think everyone's favorite activity was decorating the donuts! The birthday boy ended up just eating spoonfuls of candy. And I let him. 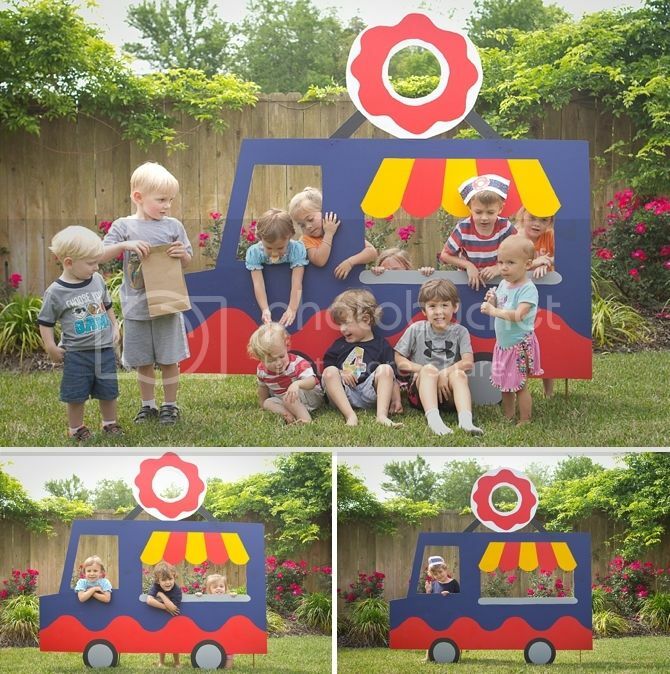 I tried to get a picture of all the kids with the donut truck... but that was like taking a picture of a bunch of animals. Literally. Still love the picture, even though I think only two kids looked at the camera! You may see this truck show back up next week as a Police truck... if I find some time to paint! Happy birthday Braden! I hope you come down from your sugar high soon. You are just as sweet as all the donuts. Vic's cookies really are beyond. So cute. Fiona is taking doughnuts to school on Friday for her birthday. She also wants to take ketchup, but I'm hoping she forgets. Rachel - that is beyond adorable! 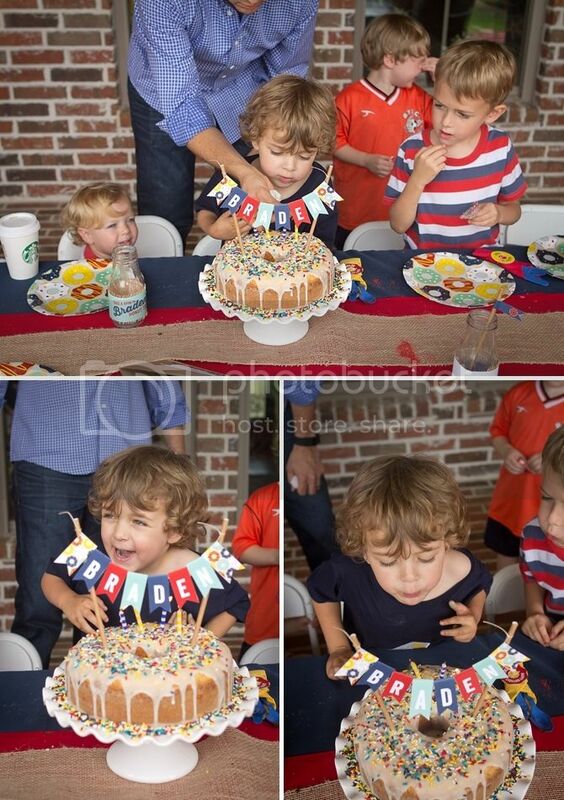 Well done and looking at Braden's happy happy face is priceless! 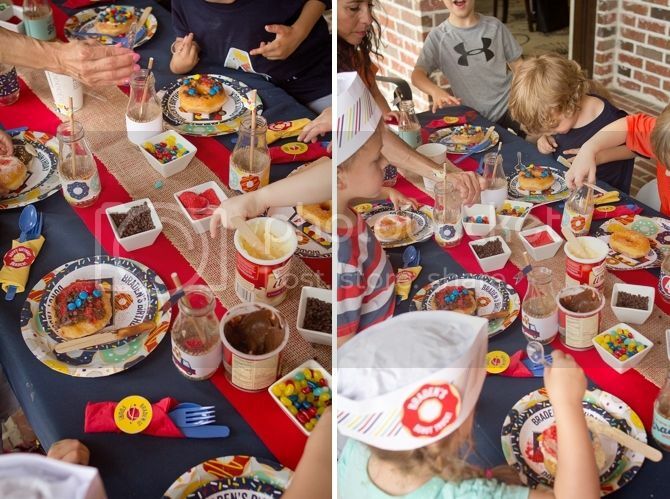 I can't decide if this post makes me feel better or worse about Robert's 2nd birthday party on Saturday: 13 bagels from Panera, 2 tubs of cream cheese, 2 bottles of bloody mary mix, and a handle of vodka. I even found an only-slightly-broken candle to stick in a bagel for the "Happy Birthday To You" song. As always, you do an amazing job. 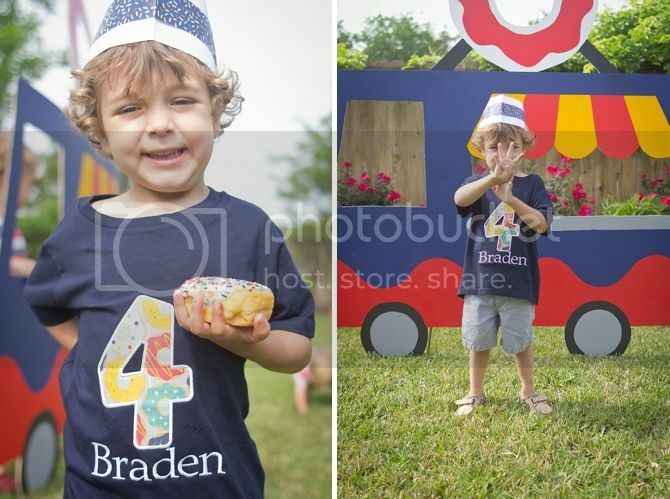 I think my favorite picture is of Braden eating spoonfuls of sprinkles. 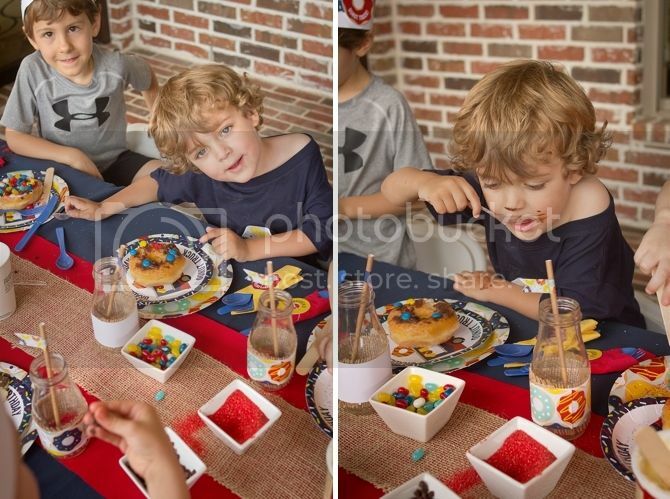 I know I got a sugar high just from looking at the photos! I think all of the children must have had a wonderful time. Donuts rule!